BLACK STONE CHERRY’s current album ‘Kentucky’ (released via the Mascot Label Group) crashed into the UK album charts at #5 on its release in April and received plaudits a-plenty across the board. Last week the band unveiled their new video for ‘The Rambler’, that you can check out here; https://youtu.be/xZepHvVzj_0. The clip features country music star and actor, Billy Ray Cyrus in the ‘title’ role. 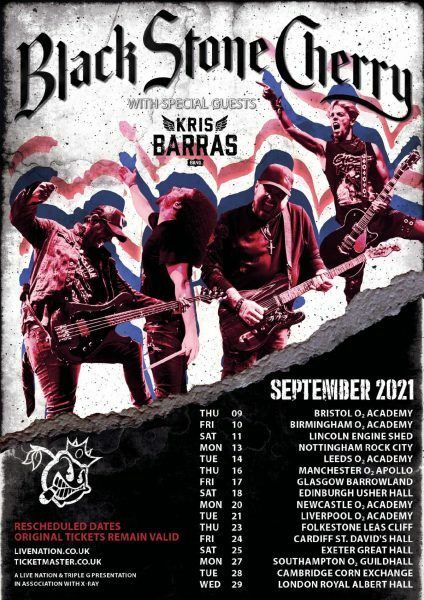 Tickets go on general sale at 10am Friday 29th July from http://www.livenation.co.uk/artist/black-stone-cherry-tickets. Planet Rockstock tickets can be grabbed from www.planetrock.com/rockstock.